As I recently mentioned, I’m a sucker for sauces. I don’t think I could ever chose just one favorite, but I think honey mustard is towards the top of the list. 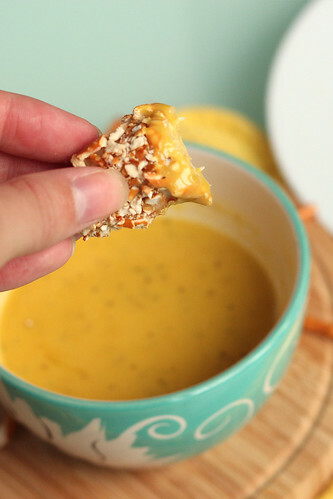 Honey mustard seems to go especially well with chicken and pretzels, so pretzel crusted chicken and honey mustard dipping sauce seemed like a match made in heaven. And it was! My friend Nikki recently shared the recipe she uses for honey mustard, so I used that as a jumping off point. Side note, I said “recently” then when I went to copy the URL I realized the post was from January. Wow. Time flies!! I wanted a stronger mustard taste so I cut the mayonnaise in half and added a little dijon mustard. The result was a dipping sauce that I easily could have eaten with a spoon. For the chicken, I used a classic breading method. We loved how crunchy the crust was, and it really seemed to hold in the moisture of the chicken. It was really the perfect vehicle for the honey mustard dipping sauce. Preheat oven to 375 degrees, line a baking sheet with parchment paper. Place pretzels in the bowl of food processor and pulse in 5-10 second increments until the pretzels are crushed, but not so long that they turn to powder. Alternatively, place pretzels in a Ziploc bag and beat with a rolling pin until crushed. Place whole wheat flour and eggs separate bowls. In a third bowl, stir together the crushed pretzels, garlic powder, onion powder, pepper, and cayenne pepper. 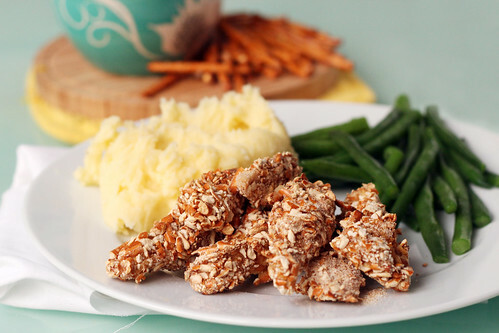 Lightly coat the chicken strips with whole wheat flour, then dip in the egg, then in the pretzel mixture. Place on the prepared baking sheet and repeat with remaining chicken. Bake for 6-7 minutes then carefully turn over with cooking tongs and bake for another 6-7 minutes, or until chicken is cooked through. Whisk together all ingredients. Chill for 1-2 hours before serving. 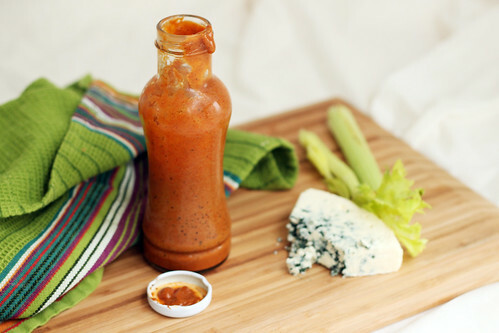 Over the past several years Buffalo Sauce has become quite the fad ingredient. I’ve seen it used in pasta, on pizza, in casseroles, and in dip known to some as “Crack Dip”… For most people I think it’s a love it or hate it type of situation. For me, I love it. 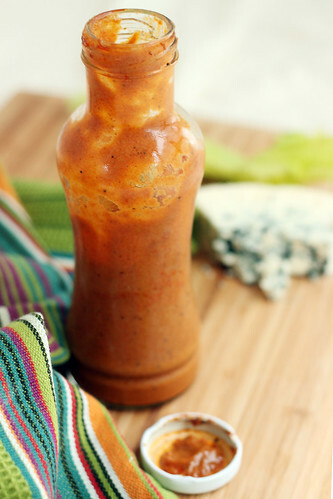 I’ve always been a pretty big fan of dip like sauces, and when I discovered Buffalo Sauce – I fell in love. Buffalo Wild Wings (B-dubs) was the place to hangout in high school. 10 cent wing Mondays and 15 cent boneless wing Tuesdays. Of course, the price slowly increased and I think a few years later they dropped the deal nights entirely, but the flavor of Buffalo sauce still brings me right back to those days of cruising around all day with my friends and then heading to B-dubs for a cheap (and delicious!) dinner. My favorite sauce was always the Spicy Garlic and last week I really had a craving for it. I knew if I wanted to satisfy my craving I would need to make my own sauce. I found a copycat recipe that looked pretty good, but it still used a lot of Franks Red Hot. I have a bottle of Red Hot but it was pretty pricy so I wasn’t that excited about having to use almost the whole thing to make my own sauce. Also, one thing I have always liked about B-dubs sauce is that it is thick and emulsified, so it doesn’t separate when used in recipes or on wings. So I kept that recipe in mind and continued searching and until I found another recipe that looked good. I took the best of both recipes and combined it to make, what I think, was an awesome sauce. It’s not exactly like B-dubs sauce, but Jesse and I both really liked it! Spicy, garlicky, smooth, and thick. *The recipe originally called for Rice Wine Vinegar, which I thought I had but turns out I did not. I used Apple Cider Vinegar instead and I think it really worked. **Feel free to add more or less of each spice, to suit your own taste. *** 8/13/12 – After some experimentation I have decided that egg yolk is not necessary, reducing the vinegar and adding the little bit of corn starch is plenty sufficient for thickening the sauce. I also decided that 1 tsp of smoked paprika could be a little overpowering, and 1/2 tsp is just right. To a small sauce pan over medium-high heat, add the vinegar, dry spices, salt, sugar, black pepper, and canola oil. Bring to a simmer, reduce the heat to medium-low and cook for 5-7 minutes, or until the mixture starts to thicken. While the vinegar and spices are simmering, whisk together the egg yolk, water, and cornstarch. Temper the yolk mixture by adding a few teaspoons of the hot vinegar mixture to the liquid and whisk. Repeat two times, then stream the now warm yolk mixture into the sauce pan, whisking constantly. 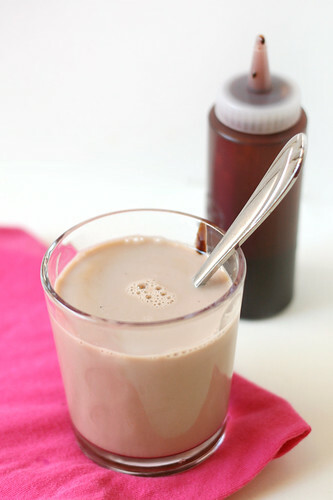 Simmer for 1-2 minutes, then remove from heat and allow to cool before pouring into a container for storing. Add additional water, as needed, if the sauce becomes too thick. 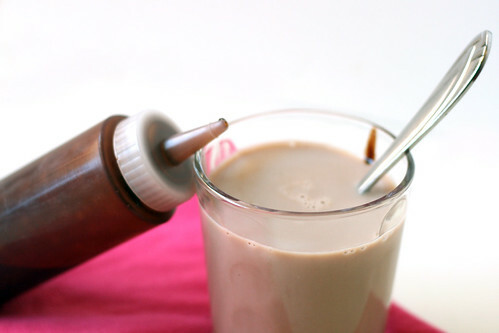 Optionally, pour the sauce into a heat proof measuring cup and use an immersion blender to make it extra smooth. 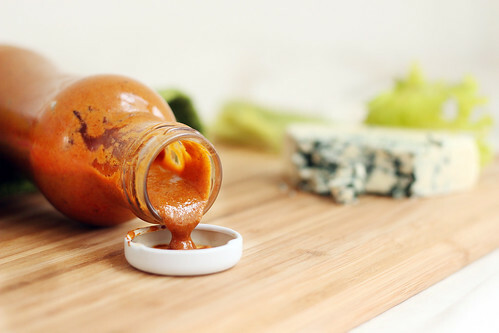 Use on wings, as a dipping sauce for fries, in your favorite Buffalo sauce recipe, or on Buffalo Chicken Sliders (recipe coming this week!). How can I use this sauce? ?